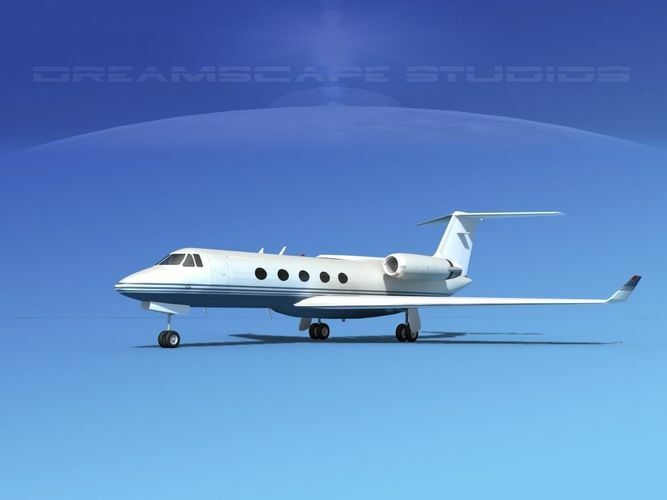 The Gulfstream G-V is a business jet produced by Gulfstream Aerospace. Currently not in production new versions are in production. The Gulfstream G-V is a 12 passenger business executive transport with a cruise speed of 488 knots and a range of 6500 miles. It is capable of flying at 51000 feet and can operate from smaller airports giving it more versatility in destinations. It is powered by two Rolls Royce turbo fan engines rated at 14750 lbs thrust each. It has a maximum speed of 672 mph or .885 times the speed of sound. This model is built near to scale. It is detailed and fully textured. It has retractable landing gear, animatable turbines, ailerons, flaps, elevators and rudder. This model comes with all materials as shown and in several available formats.